From acclaimed director Jim Jarmusch, 2016’s Gimme Danger offers a documentary. In this piece, Jarmusch looks at the life of time of legendary rockers the Stooges. Throughout Danger, we find interviews with Stooges Iggy Pop, James Williamson, Steve Mackay, Scott Asheton, and Ron Asheton, bandmembers’ sister Kathy Asheton, former manager Danny Fields, and musician Mike Watt. Danger opts for a fairly standard documentary framework. 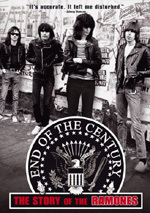 Though the film starts with a look at the band’s disintegration in 1973, it usually follows a typical chronological approach. This means we go back to learn about Iggy’s youth and early days in music as well as the late 1960s formation of the Stooges. From there the film goes into their progress as a band, getting a recording contract/making albums, and other aspects of their career. These lead toward their split and aftermath. However the Stooges actually functioned, Iggy remains far and away their best-known member. Indeed, for the general public, I think Iggy is the Stooges. Danger essentially adopts that POV, as it focuses on Iggy to the exclusion of most other threads. I get some of this – like I said, Iggy exists as the most prominent member, so I expect Pop to come to the fore. The fact that most of Iggy’s fellow Stooges have died accentuates this trend. Of the founding members, Dave Alexander left us all the way back in 1975, while Ron Asheton passed in 2009 and Scott Asheton went in 2014. Obviously this limits the involvement of the original Stooges. It appears Jarmusch managed to get in some sessions with Scott before he died, but Ron only appears via archival clips, and we find nothing at all from Alexander. All of this means I comprehend and accept Danger’s emphasis on Iggy – but I still wish the film spread itself in a broader manner. The film leaves little room to explore the Stooges beyond the Iggy perspective, so it feels a bit claustrophobic and limited. Danger could also use more archival footage. We get quick snippets of Stooges music/performances but rarely more than that, so viewers less familiar with their work won’t get a good flavor for what they did. A greater array of older material might not broaden Danger from its Iggy-centric tone, but it’d give the film more variety. We occasionally hear from Stooges-era Iggy – and get other nuggets like Iggy and David Bowie on Dinah Shore’s talk show – but again, these snippets fly by rapidly. They tease us but don’t show us very much. As history, Danger seems incomplete. While it focuses on Iggy’s career, it skips large portions and leaves major gaps. Heck, even the dissolution of the band alluded to at the opening doesn’t develop well once the documentary catches up with it. I don’t want to convey that Danger fails to offer an interesting film, as it remains reasonably entertaining – for a while, at least. The movie’s final third loses a lot of steam, mainly because Jarmusch spends much of that time on the band’s legacy/21st century reunion. A little of this material goes a long way and could’ve been dealt with more quickly – time that could’ve been better spent with band history. Still, for its first 80 minutes or so, Danger provides an intriguing story. Even with its limited scope, we get some good observations, and we learn a decent amount about Iggy’s life and career. All of this leaves Danger as a documentary that doesn’t really live to its premise. The DVD promises “the story of the Stooges” but instead, it offers a superficial overview that sticks with its most famous member above all else. It’s an easy film to watch but one whose limitations cause frustration. Gimme Danger appears in an aspect ratio of approximately 1.78:1 on this single-sided, double-layered DVD; the image has been enhanced for 16X9 televisions. Given the nature of the production, the picture quality seemed fairly positive. I didn’t factor the archival material not shot explicitly for Danger into my grade. Those elements demonstrated all sorts of flaws, but it didn’t seem fair to criticize the DVD for problems with that kind of stuff. As for the new shots, they presented reasonably solid sharpness. Given the restrictions of SD-DVD, the shots weren’t super-tight, but they seemed fine. Those bits portrayed no problems with jagged edges or shimmering, and edge haloes remained absent. As for source flaws, none occurred. Not surprisingly, the DVD’s palette tended toward natural tones. The movie’s hues came across with acceptable clarity and definition. Blacks also seemed deep and firm, while the occasional low-light shots appeared well defined and clean. I found the image to seem satisfactory for this sort of flick. Given the film’s focus, I expected little from the Dolby Digital 5.1 soundtrack of Gimme Danger, and it delivered a fairly restricted sonic experience. As expected, music dominated, so the songs spread across various channels. The mix used these in a decent manner, though localization wasn’t always great. Effects tended toward reinforcement, though various elements contributed a bit of involvement at times. We’d get audio to accentuate ideas, and these would add material around the spectrum. Matters remained pretty chatty most of the time, but the effects brought a little oomph. Audio quality seemed okay. Music could’ve had more range, though, as the songs tended to be a little on the thin side. Speech remained concise and intelligible, while effects showed reasonable accuracy. The track worked fine for a documentary. The DVD includes no extras of any sort – not even previews! 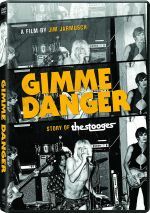 Despite a promise to tell “the story of the Stooges”, Gimme Danger spends most of its time on one band member: Iggy Pop. Some of that makes sense, but the film’s limited perspective means it lacks the necessary scope. The DVD brings us acceptable picture and audio but it provides no supplements at all. Danger seems mostly enjoyable but superficial.